This is a comprehensive review and resource page for Rylo, a 5.8K 360 camera which has one of the best stabilization among all 360 cameras I’ve tested to date, and other unique features and capabilities. 11/9 UPDATE: I’ve added comparisons against Insta360 One X, GoPro Fusion and other popular 360 cameras. UPDATE: On November 8, 2018, Rylo issued a major update that increased the video resolution to 5.8K, and added a new desktop app. — New!5.8K video mode sample video and comparison . New! Comparisons between Rylo, GoPro Fusion, Insta360 One X, and other 360 cameras . Update November 8, 2018: Rylo issued a major update that increased the video resolution to 5.8K, and added a new desktop app. Updated: April 19, 2018 with new features, including a comparison between 360 mode and the new 180 mode. Updated: December 8, 2017 with review and tutorial. The improved resolution is not merely interpolated upscaling from the 4K video. The unstitched video from each lens 2912 x 2912 with a bitrate of 120mbps in H.264 format. By comparison, the bitrate on the Fusion is 60mbps per lens, and for the One X, it is 50mbps per lens, both of them in H.264 format. 1. Image stabilization: the Rylo has built-in gyro-based image stabilization to ensure not just steady action shots but a level horizon to ensure ease of viewing. 2. Shoot first, point later. Like other 360 cameras, Rylo captures all directions at once. 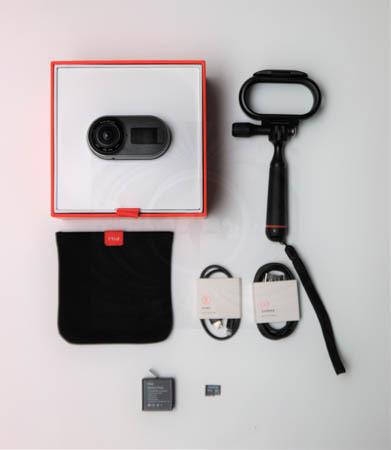 It has a built-in function in its app to convert the 360 video into a cropped 1080p video that can show any direction you choose afterward, allowing you to shoot first and point later (a feature that GoPro called Overcapture). 3. Subject tracking. When exporting a cropped video, you can follow any subject automatically like an intelligent tripod, or direct the video to face any direction. You can change the target at any number of points within the video and the video will pan smoothly from one target to the next. 4. FrontBack. This is a feature that is unique to Rylo. When exporting a cropped video, you can show a picture-in-picture effect of another view of the 360 video. You can use this for example to show the shooter’s reactions. 5. Hyperlapse. A hyperlapse is like a timelapse, but the camera is moving, which creates a surreal effect. Normally, hyperlapses take a lot of time and effort to create, requiring hundreds of photos, meticulously positioned. Rylo makes hyperlapses very easy, with convincing results. The app can fast-forward the video up to 2, 3, 4, 8, 12, or 16x. Combined with its exceptional image stabilization and optional subject tracking, the hyperlapse looks very smooth. – tiny planet mode: zooming out a video will cause it to switch to tiny planet mode. Here is a sample tiny planet video. – Bluetooth wireless control. Rylo can now be controlled wirelessly. You’ll be able to change modes, and start or stop recording. However, there is no live preview. The wireless range is about 12 feet. To use this mode, you launch the app, ensure that your phone’s Bluetooth is active, and then turn on the Rylo near your phone. The app will show a wireless icon on the top right. You tap on that and in the following dialogue box, tap on remote control. There will be an indicator for signal strength (weak or good). – 180 mode: capture a stabilized 180-degree video. Designed for use with chest mounts, when one side would be blocked. Note: in 180 mode, the active lens is the one opposite from the OLED display. 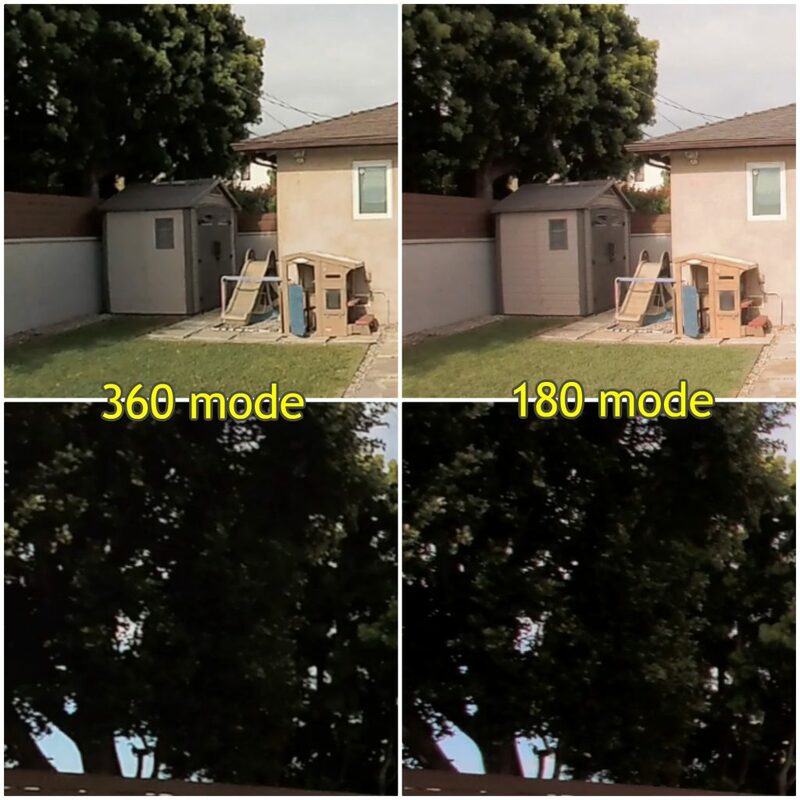 This lets the user see the recording time and other information when recording in 180 mode See below for a detailed analysis of the 180 mode image quality and stabilization . – Self-timer: there is now an optional self-timer for 3 seconds or 10 seconds. The setting is ‘sticky’ and will be retained even if the camera is disconnected from the app, or the camera is turned off. – Motion blur effect for hyperlapses. This cool effect makes hyperlapses look more cinematic. To find out more, see below under Hyperlapse. 1. Update the Rylo app. 2. Ensure that your camera is adequately charged. Connect the camera to the app via the included cable. 3. In the Rylo app, tap on the camera icon on the upper right corner of the main screen. You’ll be prompted to update the camera. 4. After the camera is fully updated, disconnect the cable and turn the camera on again. 5. You’ll now see that the Rylo icon on the upper right has a wi-fi signal indicator, showing that the app is connected to the camera. Tap on that Rylo icon and select “Remote Control”. I ordered my Rylo from Amazon. It arrived as a package with two boxes — one for the camera and another for the mini handle (“Everyday Case”). 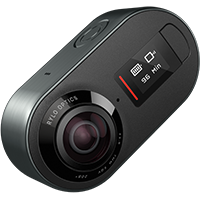 The Rylo is very small – one of the smallest 360 cameras I have. With a frame made of smooth aluminum, it feels solidly built and has some heft. It is heavier than you would expect for its size. I like its bright OLED display, similar to that of the Gear 360. I also like the spring-loaded battery door (speaking of battery, the battery is very small — not much larger than a postage stamp). The battery compartment is also where you insert the Micro SD card. I had no trouble inserting or removing the Micro SD card. The included pouch feels luxurious but has no padding, so it seems like it won’t protect from impacts. It also doesn’t seem like it would be good for wiping the lens. The everyday case is a plastic frame that protects the frame of the Rylo and has a GoPro style connector, without which there would be no way to mount the Rylo to a tripod. I’m not a fan of the GoPro connector for 360 cameras — while it is great for positioning a GoPro or conventional camera, a stabilized 360 camera is much better used when flush with the handle, to put the handle within the stitch line, thus rendering it invisible. With a GoPro connector, those new to 360 cameras will likely attempt to adjust the camera to face them, thus unnecessarily making the selfie stick visible. The everyday case has a hole on the side to allow you to connect the Rylo to a sync cable or charge cable even with the Everyday Case. The included mini handle is quite short and you can attach the included wrist strap to the end cap. The end cap is also removable and reveals a standard 1/4-20 tripod hole. At the time I reviewed the Rylo, it suffered from poor low light performance. The December 2017 update improved this slightly. I have not yet tested Rylo in low light after the April 2018 update. For photos, the Rylo’s quality is nice enough, and the April 2018 update finally added both a self timer and a remote trigger option. However, it does not yet have exposure controls. Here’s how to shoot with the Rylo and use its special features. See also the video review above, which incorporates a tutorial. The Rylo is one of the easiest and simplest 360 cameras to use. There are only two buttons: a shutter button (doubles as a power button), and a mode button beside the OLED display. To turn on the Rylo, you simply hold down the shutter. Then you can use the mode button to switch between video or photo. For photos, just use the shutter to take a photo. For videos, use the shutter to start or stop recording. That’s it. There are no other controls and no shooting settings. There’s no live preview either because it can’t connect to a phone for shooting. One unique feature of the Rylo is that it can vibrate to give haptic feedback when you turn it on, or take a photo or start or stop a video. I think this is useful for situations where you don’t want beeping or when it’s so noisy that you can’t hear the beep, but you want to make sure that the shot was taken. If you connect the Rylo to the phone app, you can tap the upper right corner of the app screen (on the camera icon) to access the camera settings. From there, you can change the recording from Normal to High, turn the beeping on or off, and turn the vibration on or off. Rylo photos and videos must be stitched in the smartphone app. There is no desktop app. After installing the Rylo app, you connect the Rylo to your phone with the sync cable (a Micro USB to lightning port cable). 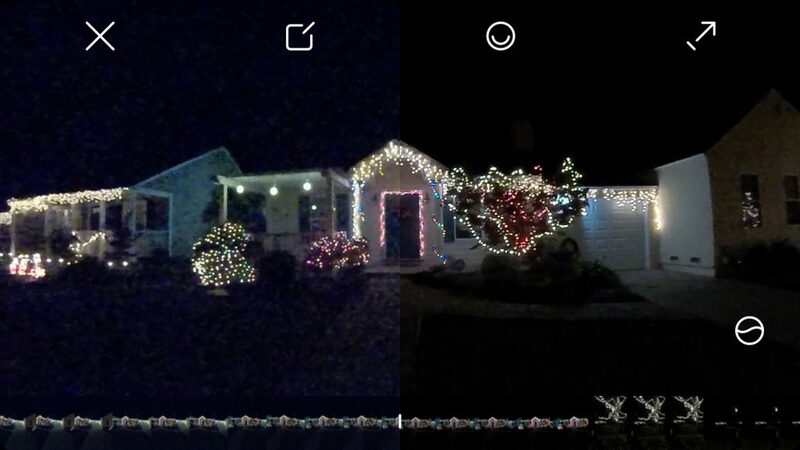 The camera turns on automatically and the app launches automatically. From the app, you’ll see rectangular thumbnails of the photos and videos in the camera. You tap on the ones you want to download to your phone. Downloading is reasonably fast. Once downloaded, the photos and videos are immediately viewable in 360. – Trim: trim the start and end of the video. – New! Crop: you can change the aspect ratio of a cropped video, from landscape, square, portrait, and the cinematic mode (2.35:1 aspect ratio). The cinematic mode has three benefits: first, it makes the video seem more cinematic (insofar as the 2.35:1 aspect ratio is associated with movies). Second, the audience can see a wider view. Third, because the field of view is wider, the video will seem more detailed and noise will be less noticeable. – New! Tune: you can adjust the appearance of the photo or video. You can adjust the brightness / exposure, contrast, highlights, shadows, and vibrance (similar to saturation). – Speed: you can increase the speed of the video to create a hyperlapse effect. You won’t see a preview of the hyperlapse effect. Instead, you’ll just have to look at the rendered file, using trial and error to find the best speed. And while that is not as straightforward as it could be, it’s still far easier than a traditional hyperlapse, which requires hundreds of photos. – Stabilization: you adjust the horizon if it is not completely level. – Look here: this allows you to cause the video to face any direction (even up or down). More than one point can be specified, in which case each point acts as a keyframe. – Follow this: this lets you choose a subject and the video will follow that subject. As with Look Here, you can change the subject of the Follow This. You can also mix and match Look Here and Follow This, although of course only one of them can be active at any given time. – Frontback: this is a unique feature of the Rylo that creates a picture-in-picture overlay of a second point of view. By default, it is the camera facing the user, but it doesn’t have to be. You can make it face any direction, adjust the field of view, the shape (circle, capsule, or half of the screen), and its location (left, right, or in the case of a portrait orientation video, on the bottom). After editing the photo or video, you can export the video as a 360 video or as a 1080p video, and you can share it to Facebook, YouTube, or Instagram. Rylo seems to require a lot of storage on your phone or tablet. I had a 9 minute video file and it wouldn’t let me export it in 4K 360 video despite having almost 20GB free space on my tablet. This is quite puzzling given the limited video quality. One workaround for longer videos is to trim it into shorter segments (5 mins or less) then combine them later in post-processing. On November 8, 2018, Rylo released a desktop app for MacOS. 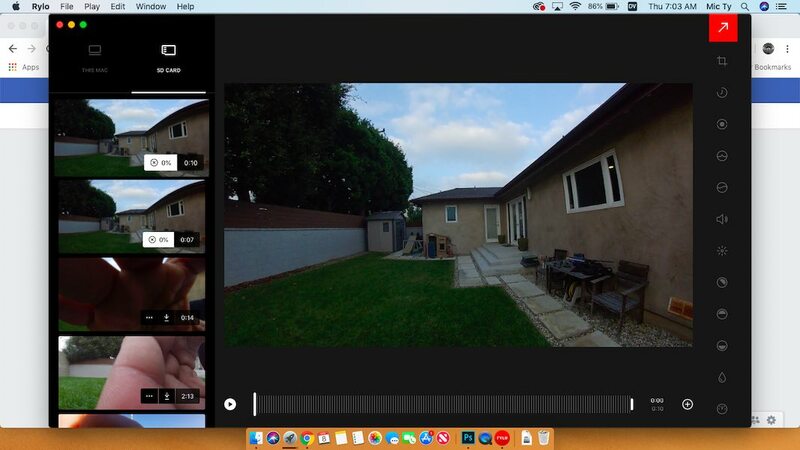 The desktop app is surprisingly full-featured with almost all the features available on the mobile app (other than frontback), including keyframing, tiny planet mode, image adjustment, and exporting of a video as a non-360 overcapture video. The desktop app can stitch Rylo files from either the hard drive or a Micro SD card. However, when I tried stitching from a Micro SD card, my Mac (admittedly with modest specs — early 2015 Air with i7, 8GB, Intel HD 6000, 256GB SSD) was unable to copy the file. Fortunately, my Mac was able to stitch from the hard drive, despite lacking a graphics card. However, stitching a 7-sec. 5.8K video took 4 mins. 28 seconds on my laptop. By comparison a 10 sec. 4K video took only about 30 secs. to stitch on the same Mac. This suggests that a graphics card is all but required to use the 5.8K mode. Here is a 360 photo, with a similar 360 photo by Insta360 ONE for comparison (click on the thumbnail on the bottom). The Rylo’s 360 photos are pretty good. In particular, I like the sharpness and tonality. It’s a little undersaturated straight out of the cam, but that can be fixed in postprocessing. The biggest issue is the lack of exposure controls. Note that my first unit had a misalignment in stitching. I returned it and got a replacement. The second unit had no stitching issues. The 5.8K mode has more detail, most noticeably visible around the window frame across from the camera. 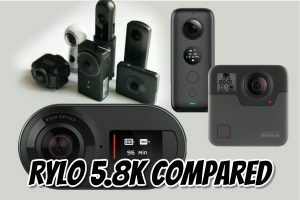 Using the Ultimate 360 Camera Comparison tool, I compared the Rylo at 5.8K with several other popular 360 cameras, including the GoPro Fusion and Insta360 One X. 1. Rylo 5.8K vs. Ricoh Theta V: Rylo is far more detailed than Ricoh Theta V (reviewed here). It also has far better stabilization than the Theta. 2. Rylo 5.8K vs. Xiaomi Mi Sphere: Rylo’s 5.8K mode is also far more detailed than the 4K video of the Xiaomi Mi Sphere (reviewed here). Rylo also has far superior stabilization compared to the Mi Sphere. 3. 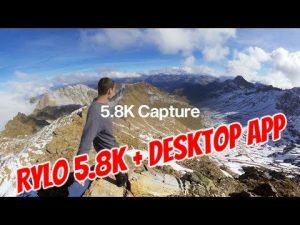 Rylo 5.8K vs. Garmin Virb 360: Rylo’s 5.8K mode is much more detailed than Garmin Virb 360, even though on paper Garmin Virb 360 has almost the same video resolution at 5.7K. 4. Rylo 5.8K vs. Yi 360 VR: The Yi 360 VR (reviewed here) with 5.7K video had the second most detailed 360 video for consumer 360 cameras until the Insta360 One X. The Rylo has now surpassed the Yi 360 VR for detail as well. 5. Rylo 5.8K vs. GoPro Fusion: Rylo appears slightly less detailed than GoPro Fusion (reviewed here), most noticeably in the shed as well as in the shadow detail in the trees. 6. Rylo vs. Insta360 One X: Rylo is slightly less detailed than Insta360 One X (reviewed here). The One X sample here was in log mode, hence the lower contrast), as most clearly noticeable in the details of the shed, as well as in the One X’s shadow detail. So far, most samples from Rylo have been in 1080p 16:9 format, but rest assured that the Rylo is also capable of saving to conventional equirectangular 360 photo or 360 video format. Traditionally, a hyperlapse is made by placing a camera on a tripod, taking a photo, moving the camera and tripod slightly, then taking another photo, etc. Then finally combining those photos, playing them at around 24 or 30fps as a video. It is tedious work. However, Rylo makes it incredibly easy to create a hyperlapse. It has five features that makes it an excellent camera for creating a hyperlapse. First, when you shoot a 360 video with the Rylo, it is incredibly stable so it looks like a hyperlapse video shot on a tripod. Second, as a 360 camera, it captures all angles simultaneously, making it possible to make smooth panning movements in post production. Third, it has two autofollow functions (Look Here and Follow This) that make it easy to ‘aim’ the camera at any target consistently. Fourth, it has a built-in speed adjustment up to 16x, which makes it easy to simulate a hyperlapse with a fast forwarded video. Finally, it has a new motion blur option that can make hyperlapses look more cinematic. Not only does Rylo make it easy to create a hyperlapse, but some hyperlapse effects would be difficult to do using a traditional hyperlapse, such as going up or down a flight of stairs (it would be difficult to move the camera position smoothly over the stairs). When you take all of the foregoing into consideration, the conclusion is that Rylo is an amazing tool for hyperlapse videos. 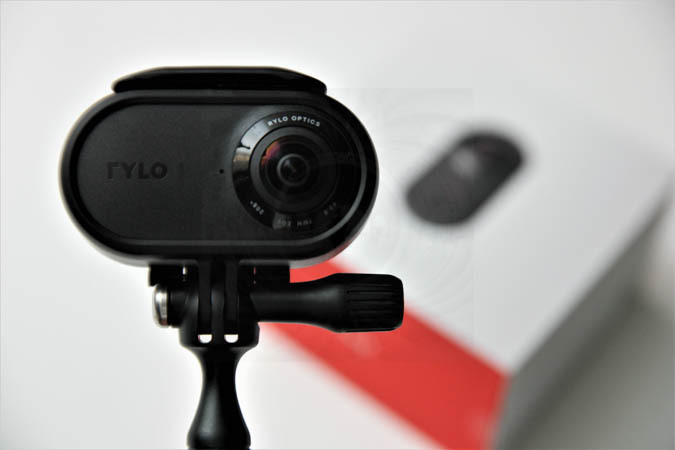 Rylo’s April 2018 update introduced a new 180-degree mode, intended for use when the Rylo is chest mounted, or has one lens blocked. What is the advantage of using the 180 mode in such circumstances? You can see that the 180 mode has noticeably more detail, and has more details in the shadows. Next I compared the 360 mode and 180 mode for stabilization. Here are cropped videos from each. With its compact, capsule-like shape and single button operation, Rylo is often compared to Insta360 ONE (reviewed here), which is also a compact stabilized 4K 360 camera. But there are definitely important differences between them. Here is a list of their similarities, and their respective advantages and disadvantages. o Both can reframe the 360 video as a conventional 16:9 video. Both have keyframing as well. o Both have a time lapse feature. o Both have an optional waterproof case. o Both have a picture-in-picture effect with one lens facing you to show your reaction (an effect that Insta360 One copied from Rylo). 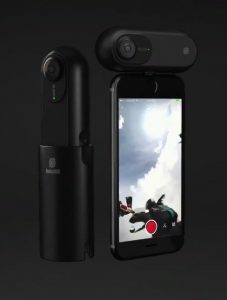 – Insta360 One X has two stabilization modes: one that is stabilized to a fixed compass heading, and another which is stabilized according to the camera’s forward view. The Rylo has only the second (forward facing) stabilization mode. – FreeCapture: this is a unique feature of the Insta360 ONE that allows you to reframe a 360 video by holding your phone as a virtual camera. This allows you to capture videos that look natural, instead of robotic camera movements from keyframing. See this in-depth look at why FreeCapture is different. + Sharpness (video): With Rylo’s 5.8K mode, it is definitely sharper than the Insta360 One (not to be confused with the newer Insta360 One X). o Sharpness (photo): similar amount of detail. o Dynamic range: Rylo has better highlight range and detail, while Insta360 One has better shadow detail. + Flare resistance: Rylo is noticeably superior. The ONE is actually decent at flare resistance but its lens is some kind of fingerprint magnet (oleophilic) that is very hard to keep clean. o Chromatic aberration: both Rylo and the ONE are excellent. + Exposure: Insta360 One’s exposure is a little too aggressive and shots can appear overexposed (after its March 2018 update). Rylo’s exposure is slightly underexposed. – Colors: Rylo is slightly undersaturated. The ONE is slightly saturated but still looks good. Most consumers would find the ONE more appealing. For action videos in daylight, I would prefer to use Rylo. For photos and for indoor or lower light videos, I would prefer Insta360 ONE. Rylo has very good image quality in daylight. In 5.8K mode, it is one of the most detailed consumer 360 cameras. Its image stabilization is one of the best, if not the best, for consumer 360 cameras. I also like its hyperlapse mode, which is exceptionally smooth and very easy to use, and when it is combined with the Follow This feature, can create impressive hyperlapse videos. Its weakness is that it has less shadow detail compared to competing 360 cameras. For photos, Rylo has good image quality and is now more usable due to the remote trigger and the self-timer up to 10 seconds. However, please note there is no live preview and no exposure controls. Photo is now 8.4, approximately similar to Samsung Gear 360 2016. It now has a remote shutter and has a self-timer, making it much more useful. In terms of image quality, it is more detailed than Ricoh Theta, with consistent sharpness throughout the frame, minimal chromatic aberration, and good resistance to flare. However, it lacks exposure controls (not even exposure compensation). 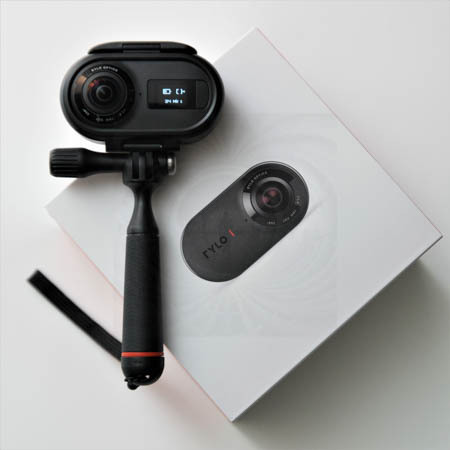 Video is now 8.8, better than most other 360 cameras including the Yi 360 VR, Garmin Virb 360, and Ricoh Theta V. It has the third highest video quality after the GoPro Fusion (rated 9.0) and Insta360 One X (rated 8.9). It has excellent detail in highlights, but mediocre detail in shadows. This is mitigated by the possible use of 180 mode, which does have higher image quality, albeit with less versatility. Stabilization is 9.0, a huge improvement compared to the baseline (average 360 camera stabilization of February 2018). This has the best stabilization performance I’ve tested as of September 2018. Usability is unchanged at 8.3, slightly above average. The app is excellent and convenient, and there is a desktop app with almost all the features of the mobile app, including keyframing. The weakness of the desktop app is that first, there is no Windows version yet, and second, there is no batch exporting. Every photo or video must be stitched one by one. As for the mobile workflow, Rylo uses a cable to be connected to the app, which is faster than wireless, but only the original cable works for the iOS version. This means that if you lose the cable, you won’t be able to use the app or stitch any photo or video until you buy a replacement cable. Rylo is available on Amazon. As of March 2018, the discount program for Rylo has expired. If you’d like to discuss Rylo openly and candidly, check out the Rylo user group on Facebook. Please bookmark this page — I will update it with more information. Vuze XR Review and Comparison posted! Thanks Matt. What i don’t understand is why no one has posted a 360 video as opposed to a cropped / overcapture style video. If I am not completely mistaken it is not possible to create real 360degree clips; just cropped ones. Thanks Oliver. Hmm if that is so, then they should disclose that. It’s kind of strange to advertise a 360 camera without it being capable of creating 360 videos or photos. It’s also strange for them to call it 4K if it will never produce a 4K file (based on only cropped files). Meanwhile I could find out that indeed it is possible to create 360degree footage but this feature does not seem to be more than a footnote. The clear intention the producers had in mind is to crop 1080 flat footage fron the original clip. Btw: does yi360 vr offer this function as well? Hi Oliver. Yes Rylo can produce 360 videos (not just reframed). My Rylo just got delivered so I will be testing it asap. Yi does not have a built-in function for reframing videos. But you can use Insta360 studio and magix to do that. And I will show how to do it with a phone app 😀 Best regards, Mic. Wow, that footage looks grainy and unusable. Thanks John. Rylo has a hard time dealing with anything less than bright light. But for viewing on a phone this video might look ok. There are now more (real) reviews on Amazon. Definitely not 5 stars anymore! Hello, good morning (in Spain) Can you help me? I want to buy a camera per otengo doubts among several, including the rylo. The use will be to record some videos running through the mountains but surely especially for photos and videos with the family. My question is mijia, urges 360 nano S, insta360 one or rylo. can anybody help me? Wow, its amazing camera. This is small and i love this. What’s your opinion on Rylo vs. Insta360 One X? For me, the availability of the scuba case – and a plethora of other accessories – for the Insta seals the deal. Hi Max. I prefer Insta360 One X because it’s more detailed and has a better workflow. Thanks Mic. Then the question becomes, is the X’s better quality worth the extra cost and size over the One? Actually, unless I’m mistaken, the One doesn’t have a scuba case – only the X does. So that makes the decision clear for me, which I like; but what do you think?